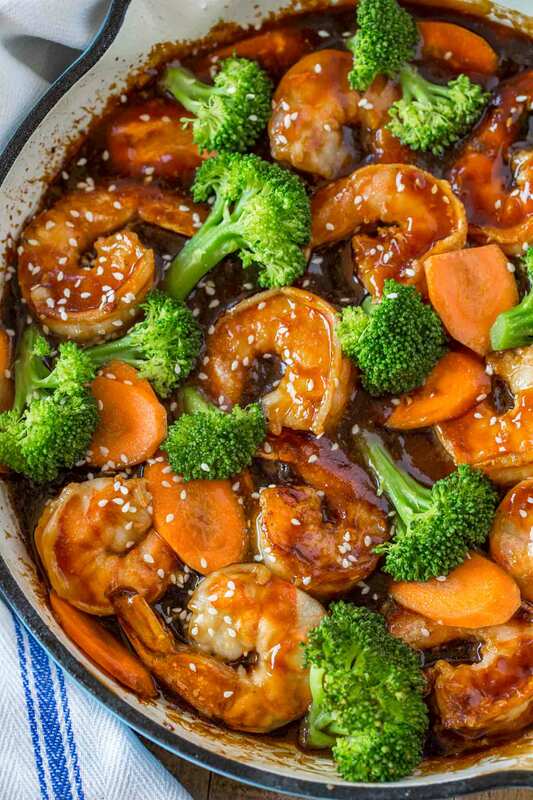 Shrimp Stir-fry with an easy honey garlic soy-sauce, plump seared shrimp and vegetables in less than 20 minutes. 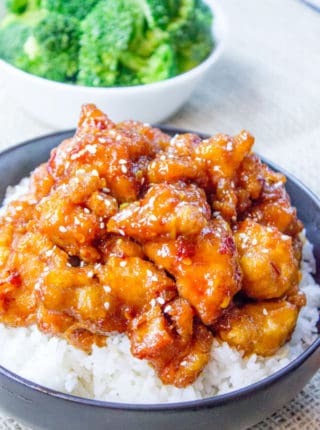 Easy Asian recipes are one of the main focuses of the blog including General Tso’s Chicken, Chicken Lo Mein and Easy Mongolian Beef. 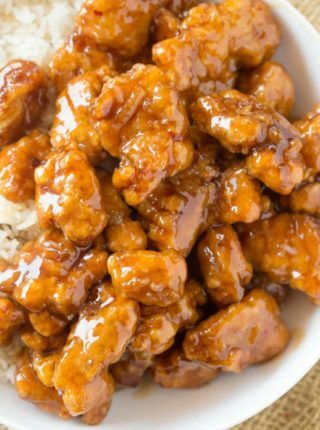 We’ve got an entire Chinese restaurant menu worth of recipes for you to choose from on the site! Easy base recipe here! 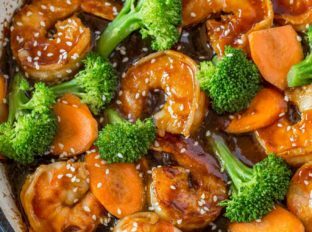 This shrimp stir-fry is an easy pantry recipe for you to keep in your back pocket anytime you’d like to make a healthy, easy stir fry. Why do I call it a base recipe? Because I could just as easily swap out any protein or vegetable with this easy stir-fry sauce and make this with anything I’ve got in the fridge. You can make this exact dish with sliced chicken breast or thighs, pork loin, sliced beef, scallops or any firm fish you love. Stir-Fries are an easy weeknight dinner you can make in just 20 minutes. In fact if you were to meal prep this dish over the weekend it could be made in less than 10 minutes the night you’re enjoying it. Can you make this Shrimp Stir-Fry ahead of time? You can certainly make parts of it ahead of time. Seafood is not tolerant of cooking and reheating so I recommend preparing all the individual parts of the recipe ahead but cooking it just before you eat it. First mix the sauce ingredients together and set aside and second prep the shrimp and vegetables. I tend to buy peeled and deveined shrimp but if you don’t the most time consuming part of the dish will be preparing the shrimp. Once the sauce, shrimp and veggies are prepared you just have to cook and combine them in the pan before serving. Since stir-fries cook so quickly it’s a good idea to have your rice ready beforehand. So why choose shrimp in this recipe? Well as we head further into the holiday season and everyone’s schedules are getting busier we are reaching for easier and quicker recipes. That’s where shrimp is a GREAT option. 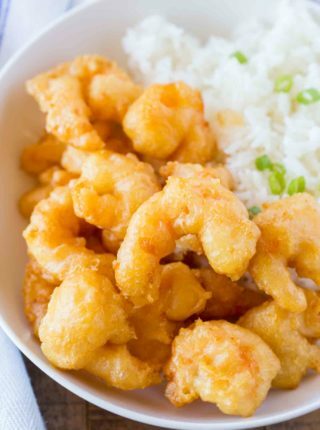 If you’re buying peeled and deveined shrimp it will cook in less than 5 minutes. More ideas for easy weeknight meals can be found all over the site, we love anything that has lots of flavor with not a lot of work. Ground Beef Recipes: Sloppy Joes are a huge part of this site because of how easy they are, we love cooking with ground beef (and chicken and turkey too!). Serve with steamed vegetables and a quick starch. We used broccoli and carrots in the dish but you can feel free to use any vegetables you’ve got in the kitchen. Stir-fries are an easy way to use up what you’ve already got. I especially love vegetables that are canned like the baby corn, chestnuts and bamboo shoots because it makes the dish even more convenient to make in a pinch. Add the water, ketchup, soy sauce, cornstarch, honey, crushed red pepper and sesame oil together in a small bowl and whisk. Add the canola oil to a large skillet over medium-high heat and add in the shrimp, ginger and garlic, cooking on each side for 1-2 minutes. Add in the broccoli and carrots and the sauce, stir and cover for 3 minutes until the broccoli and carrots are tender and the sauce is thickened. Hey Sabrina, What should i use to substitute ketchup? It’s a no go for my family and there are several recipes you have that call for it. You can always substitue with tomato sauce mixed with a bit of sugar and vinegar. I love quick and easy recipes like this! 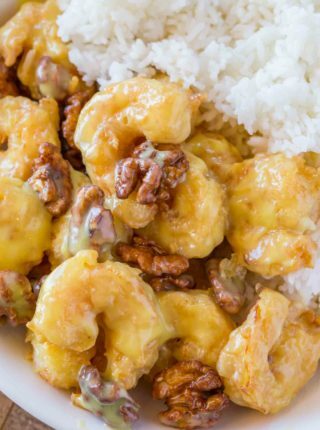 My shrimp loving boys would go crazy for this recipe! Great recipe! I love shrimp for weeknights too! Even if I forget to thaw some, it’s still takes less time than take out. 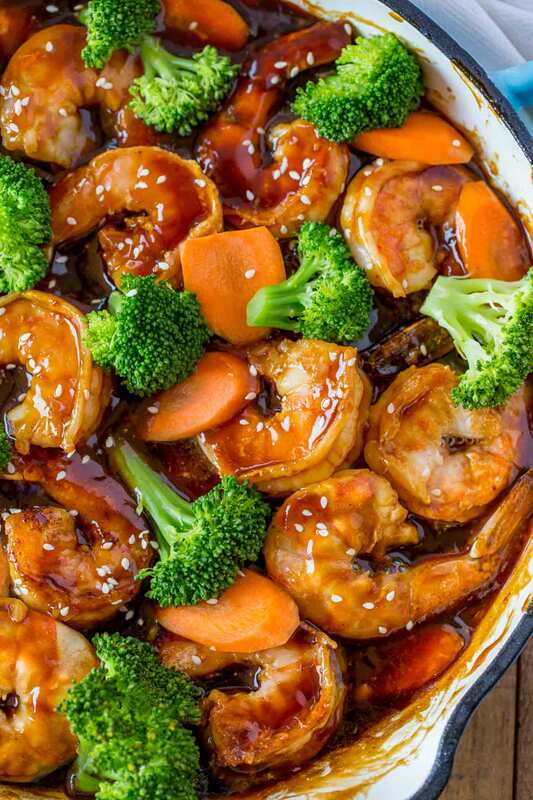 I love stir-fry so I am always happy when I find a delicious recipe with shrimp in it! Easy is my middle name! Okay, that sounds terrible. What I mean is that I love easy recipes like this!